A Speed Tuning Tool for Bosch Clas..
A Speed Tuning Tool for Bosch Classic, Active or Performance Line (respectively Gen2) engines. Also suitable for Bosch version 2014. This version of the Sx2 Dongle comes with a "Power-Switch" which enables you to turn your Dongle on/off via the Bosch HMI or Intuvia display - a very convenient solution! New: With original Bosch lightning plugs. Cablekit for the Sx2 Dongle is included. The Sx2 Dongle takes away the 25 km/h speed cut off restriction and shifts the engine support to 50 km/h (≈ 31 mph). All assistance levels of your Bosch engine will be retained. The devices causes no changes in the engine electronics. Just plug the Sx2 Dongle in and drive twice as fast with full motor power! The Sx2 Dongle needs no extra battery. Legal in 2 Seconds: Simply pull off the Dongle and drive legally on public roads again. 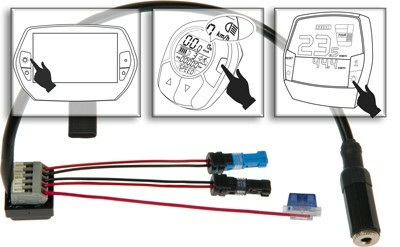 A high-quality Bosch electric bike tuning tool Made in Germany. Fabricated by the German company Maintronic. A terminal block with integrated electronics. Two Bosch light cables with original Bosch light plugs. Drive twice as fast with the motor power still assisting! It´s time to get ready with more speed! Install the Sx2 Tuning-Dongle, and the engine support of your Bosch electric bicycle doubles to 50 km/h. Switch the device comfortably on / off with the light switch of your HMI / Intuvia. By the way, all original Bosch engine assistance levels will be kept, because the Dongle activates itself automatically not until you reach a speed between 13 and 25 km/h. The use of tuning devices like the Sx2 Dongle is not allowed on public roads. But thanks to the pluggable design of the Sx2 Dongle, you can undo the tuning whenever you want to. If you want drive legally on public roads again, simply pull off the Dongle (the entire process takes just a few seconds). 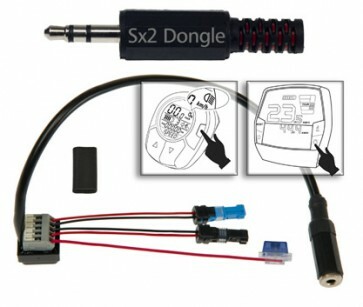 The Sx2 Tuning-Dongle is very robust and splashproof encapsulated. The device requires no battery and is permanent maintenance free. As mentioned before, the Sx2 Tuning-Dongle can be pulled of very quickly. Simply remove it if you park your electric bike somewhere and take the Dongle with you. We would like to point out that the use of tuning tools like the Sx2 Dongle is not allowed on public roads, because the device manipulates the speed of your electric bike. You may only use devices like the Sx2 Tuning Dongle on private, closed areas or on designated routes. Please drive carefully, wear security clothing and a bicycle helmet.